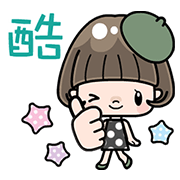 http://www.line-stickers.com/ – Animated Cute Girl with Bobbed Hair Line Sticker | Check out this fashionable girl and her bob hairstyle haircut. She’ll bounce around your chats with her cute animations! She’s so expressive and smiles a lot! Clingy Kitty: Here to Stay!